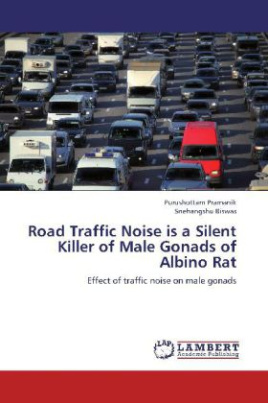 Road Traffic Noise is a silent killer of male gonads of albino rats is written by Purushottam Pramanik and Snehangshu Biswas from their study work. Noise is now considered hazards of health. Road Traffic Noise is a great problem of developing countries. It causes physical and psychological stress and associated with many diseases.We emphasizes the effect of Chronic road traffic noise exposure on male reproductive parameters including sperm count, sperm morphology and sperm viability. We also illustrate the scientists and research scholars involved in environmental hazard related research. This book gives some idea to policy maker of countries to control traffic noise to maintain reproductive health health of their people.